Forthcoming albums: Best Of 2009 1/2: Most Anticipated Albums :: The Rawking Refuses To Stop! Listen again to techno legend Derrick May's 6 Mix, showcasing the sound of Detroit's Hi Tek Soul and one of his renowned club mixes. On your free CD this month are exclusive tracks from BEHEMOTH and SATYRICON as well as brand new tracks from CRADLE OF FILTH, CTHONIC, VADER and SWALLOW THE SUN as the first part in our series of extreme CDs – Necrolust! Aiiieeeee! Virginia's melodic/technical death metal band ARSIS has set "Starve For The Devil" as the title of its fourth studio album, tentatively due in early 2010 via Nuclear Blast Records. A brand new PARADISE LOST track, entitled "Faith Divides Us - Death Unites Us", is available for streaming on the band's MySpace page. The song is the title cut of the British gothic metal act's new album, which will be released via Century Media Records on September 28, 2009 in Europe and October 6, 2009 in the U.S. Zoot Woman will release Things Are What They Used to Be in August 2009. SUPERFAMILY'S NEW ALBUM WILL BE ENTITLED 'GUNS TONIGHT' AND THE RELEASE DATE IS SET TO THE 24TH OF AUGUST 2009. New issue of Mojo magazine now on sale in the UK. Unfortunately that simpleton NME band Arctic Monkeys are on the front cover. Results of the annual ateaseweb Music Forum Top Albums of All Time poll. Reasonable inclusions of compilations were allowed. * BLEEP - The Best Albums of 2009... so far. RA News: Modeselektor mix Body Language - Get Physical will release Modeselektor's Body Language on September 25, 2009. RA News: Modular leaves them all behind - Modular will release Leave Them All Behind Vol. 3 on August 7th, 2009. A Place To Bury Strangers have announced details about their new album. Exploding Head will be released on October 5. Savannah, Georgia's BARONESS will release its second full-length album for an October release via Relapse Records. Sweden's BURST has announced plans to disband following a "best-of" performance in the group home country in the fall. Commented BURST: "Following a band meeting at the end of June, we have decided that it is time to let BURST sleep. Motech will release DJ 3000's Galactic Caravan on October 1st, 2009. EevoNext will release Future Beat Alliance's Patience and Distance on August 10, 2009. Jong Pang's delayed sophomore album "Love" is now set for release on August 10 via Tigerspring. Junius has announced plans to release a new full-length this fall. "The Martyrdom of a Catastrophist," a concept album inspired by scholar Immanuel Velikovsky, will be available on October 13th via The Mylene Sheath. "Night Is the New Day" will be released on October 19th (US - October 27th) on Peaceville Records. EMI Norway has confirmed that the new Kings of Convenience album "Declaration of dependence" will be released on October 2. The new single "Boat behind" was released to radio today (July 20). Melodic black metallers REQUIEM AETERNAM — originally from Uruguay but most recently based in Tampa Bay, Florida — have completed work on their third album, "Destiny-Man". Swedish melodic progressive death metallers SCAR SYMMETRY have set "Dark Matter Dimensions" as the title of their new album, due in October via Nuclear Blast Records. Phthalo Records will release John Tejada as Lucid Dream's Recovered Data 95 on August 11th, 2009. PIAS/Different will release Vitalic's Flashmob on September 28, 2009. The shortlist for the Barclaycard Mercury Prize for best British or Irish album of the last 12 months has been announced. Find out more about the 12 nominees below. they got the scoop first: Muso’s Guide - Articles Events Features - Barclaycard Mercury Prize: nominations revealed! The Mercury Prize 2009 shortlist of 12 nominations will be announced at 11.30am in London today. Over the past couple of weeks BBC Music Blog has asked various music bloggers of their opinions of what albums should make this year's Mercury Prize shortlist. With the Mercury prize there are 3 sets of questions pre the shortlist that spring up. what you think will make the shortlist, what albums you would like to make the shortlist? and your own personal idealist list? the first question of second guessing the judges, doesn't particularly interest me this year, unfortunately i expect the hyped Florence and the Machine to be in the shortlist. Will Lily Allen make it?, Patrick Wolf has previously been overlooked, maybe this time? will the twee Camera Obscura make it? will Diagonal represent prog rock, which hipster album will make it Late of the Pier or Friendly Fires? Will Pet Shop boys be included? looking for a newcomer try Speech Debelle? Michacu seems to be tipped by many bloggers as an outsider? jazz maybe Curious or Get The Blessing, although both Polar Bear and Acoustic Ladyland have eligible albums. All will be revealed soon ! Some Eligible Albums for the Mercury Music Prize 2009. i.e British or Irish Artists who released an album between July 28th 2008 and July 20th 2009. Note: I am not endorsing all these albums ! This list is just an indication of some albums that are eligible. I have omitted some higher profile artists that I particularly don't rate. I don't know which albums entered the competition. Pitchfork metal column: Pitchfork: Show No Mercy: Show No Mercy - This month we talk to Code [pictured], Hiems, Magrudergrind, and the reformed YOB. To coincide with Bleep’s feature on Touch, we caught up with founder, Jon Wozencroft, and asked him a few questions behind his “not a label” that has been releasing music for over 25 years. Like Scotland, Norway has managed to develop a great jazz scene, partly due to its remote geography, and the Edinburgh Jazz Festival sees performances from some of the finests Norwegian musicians. * RA News: Chromeo get their DJ Kicks - K7 will release Chromeo's DJ-KiCKS in early October. * RA News: M.A.N.D.Y. prep Get Physical's 7th Anniversary compilation - Get Physical will release M.A.N.D.Y. 's Get Physical 7th Anniversary Compilation on September 28th, 2009. * RA News: N-Type preps Rinse:09 - Rinse will release N-Type's Rinse:09 on August 3rd, 2009. Spooky, AKA Charlie May & Duncan Forbes, will enter into the mix arena for the latest edition in the Tales of the Unexpected series. The band's second album, Climb Up, is scheduled for release on Oct. 20 on ATP Records. 2009 album: RA News: Basement Jaxx prep Scars - XL will release Basement Jaxx's Scars in October 2009. Macro Recordings have just revealed the full details of Patrick Cowley and Jorge Socarras' Catholic album. Macro will release Catholic on October 5th, 2009. .
We don't know a hell of a lot about The Crêpes ; only that it's one of the worst band names ever, and that it is in fact the very tasty solo project of the chap pictured above, who's based on the west coast of Sweden. 2010 debut: RA News: Modular signs Delphic - The English three-piece will release their debut in 2010. Vakant will release Mathias Kaden's Studio 10 on September 21st, 2009.
track: Pitchfork: Track Reviews: Lindstrom - "The Magnificent"
2009 album: Mission of Burma - new album, single, MP3 & Pool Party pics - BrooklynVegan: "On October 6, Matador will be releasing Mission Of Burma's fourth studio LP, The Sound The Speed The Light." Jim O'Rourke - iconic avant-guitarist, studio whizz, super-producer, laptop-basher and pop songwriter - is to release a new album, The Visitor, on August 31 via Drag City. 2 Years have past in all our lives since the release of the port-royal's “afraid to dance” (Resonant) but the royals have been keeping very busy with writing, recording, touring the EU and Russia, as well as creating remixes for the likes of Ladytron and Felix Da Housecat. For “Dying in time” port-royal have expanded their sound to encompass the more electronically skewed perspectives of synth-pop and even techno while still holding steadfast to their roots and original core sound that has always laid somewhere between shoegaze and emotively soaring ambient. As the title may suggest there is an undercurrent of aching melancholy to the album, as if the band are expressing the feelings they have for the temporality of life's situations and feelings. 2009 album: scenepointblank: Rain Machine Tracklisting Announced - Kyp Malone of TV on the Radio's new solo project...The album is due out September 22nd via Anti Records. RA's Todd L. Burns talks to one of the most renowned remixers and unpredictable jocks about trying to remember his own productions, warming up a room and knowing when to stop. New issue of Rock-A-Rolla magazine features The Mars Volta on the front cover: ROCK-A-ROLLA ISSUE 21 OUT NOW! 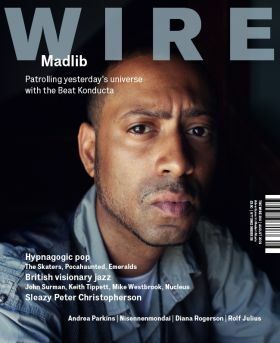 New issue of The Wire features Madlib on the front cover. New issue of Zero Tolerance Magazine features Behemoth on the front cover. On sale in the UK now. Altair Nouveau consists of one Brandon Mitchell, a young producer from the west coast currently residing in San Francisco. Altair Nouveau’s music, though designed with the dance floor in mind, still evokes a personal element. It is the combination of these elements that give Altair Nouveau his indistinguishable larger than life, spaced-out future disco sound sure to cause a dance floor frenzy. Raised in the sprawling city of San Jose, California to musical parents. Mitchell grew up with the encouragement of his father, an electronic music teacher at the local community college. Brandon began educating himself by collecting albums from the likes of Giorgio Moroder, Vangelis, Ennio Morricone and John Carpenter. This gave way to newer acts such as In Flagranti, Prins Thomas, Lindstrom and several artists on DFA. The title track ‘Space Fortress’ marks a bold and exciting introduction into the sonic landscape of Mr. Nouveau, combining G Funk, P Funk and a 4/4 disco foundation that adds up to something otherworldly altogether. ‘Showdown’ is a lush and melancholy electro track, with gentle chugging rhythms carrying you along and depositing the listener onto a bed of rich vocal harmonies. The swirling jazz funk of ‘Sorcerer’ shines bright and shimmers with sharp and punchy synth melodies, sounding like Money Mark trying to teach Herbie Hancock to break dance. You know what I mean. This single is being co-released with the very talented Maelstrom (Eskimo, Mindless Boogie) via his own dance label called Solar Disco. Have a browse through...2009 Albums [1701 Albums] - 2009 A - Z Albums Tracking List - a starting guide to new & forthcoming album releases. also: 2009 Expected [686 artists] - Artists that are expected to release new albums in 2009 - awaiting announcements of album titles and release dates. Two hours of dubby dubstep this week from the man behind Dub Police and Sub Soldiers. He's the West Londoner who along with Rusko mixed one of the first commercially available dubstep compilation CDs for Fabric Live and he's recently sprinkled his magic on Deadmau5's 'I Remember'. New issue of Terrorizer magazines features Municipal Waste on the front cover. Looks a rather disappointing issue. Back Blogging after an extended break ! Over the next few days, I will be publishing a series of Catch Up blog posts. Top 1000 Albums of 2009 @ rateyourmusic.com has been updated, Animal Collective still at Number 1. Another boring issue of Uncut magazine. We usually publish interviews with bands and occasionally an interview with an organizer of a festival or something like that. It’s not that common to interview a writer. Since we review books that might be interesting for the readers of Lords of Metal on a monthly basis in the form of a special, we got the idea to conduct an interview with Joel McIver. We reviewed his book on Slayer this month and in the past we reviewed two other books by his hand. Since Joel is one of the more important writers of books on metal at this moment, we contacted him and it was no problem for him to tell a bit more about himself. THE BATCAVE remains the best known Goth club in the history of the genre, and here we have two huge photo books of classic images, of exciting bands, covering its original existence. Woebot mix: FACT magazine: FACT mix 61: Woebot - FACT mix 61 comes from Matt Ingram, a seminal music writer and unique recording artist who mainly works under the moniker of Woebot. This Monday’s FACT podcast was the work of Matt Ingram, one of the last decade’s seminal music writers, blogging and contributing to FACT, Stylus, The Wire and more under the name WOEBOT. Compilation from Mary Anne Hobbs: FACT magazine: - Mary Anne Hobbs releases new compilation with silly name - Radio 1 Experimental Show host Mary Anne Hobbs will release her third compilation for Planet Mu, Wild Angels, on September 7. Eskimo label compilation RA News: Eskimo get cosmic - Eskimo will release Cosmic Balearic Beats Vol. 2 on 7th September 2009.